By their nature voice assistants – like the Google Home or Amazon Alexa – are nonvisual, but we have experienced that in a lot of cases voice works really good with the support of a screen. So called new generation Smart Displays offer a touch screen with a voice assistant combined. For example The Google Home Hub. A new addition to the Google Home family, and as its name suggests should play a central place in the family. You could say my house is well connected these days with two Google Home Mini’s smart speakers a dozen of Philips Hue Lights, several motion sensors, a Neato Botvac robot vacuum cleaner and a Nest Hello. My Nest Hello doorbell detects “real people” and informs me who is at the door using the Google Home Mini’s. 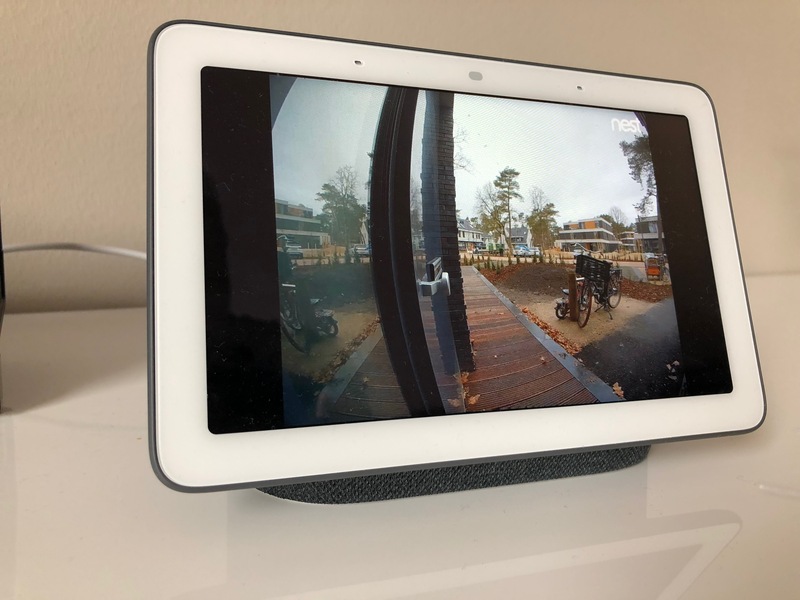 Now - using the Google Home Hub – I can see my visitors thanks to the live stream of the front-door camera. Unfortunately, the announcement who is at the door sounds gibberish because of the pronunciation of Dutch names. A helpful command in the morning is asking Google what the traffic is like to work, here an image of traffic of the route is a very helpful feature. A weather inquiry has also become a daily routine also here a clear infographic is really adding value. Using the Home Hub touch-screen when controlling Hue devices for example is clear and intuitive; it takes the room names from the Hue app and gives you the basic control over light intensity, color etc. It is easy to swipe to a room and control lights, play music or cast video. 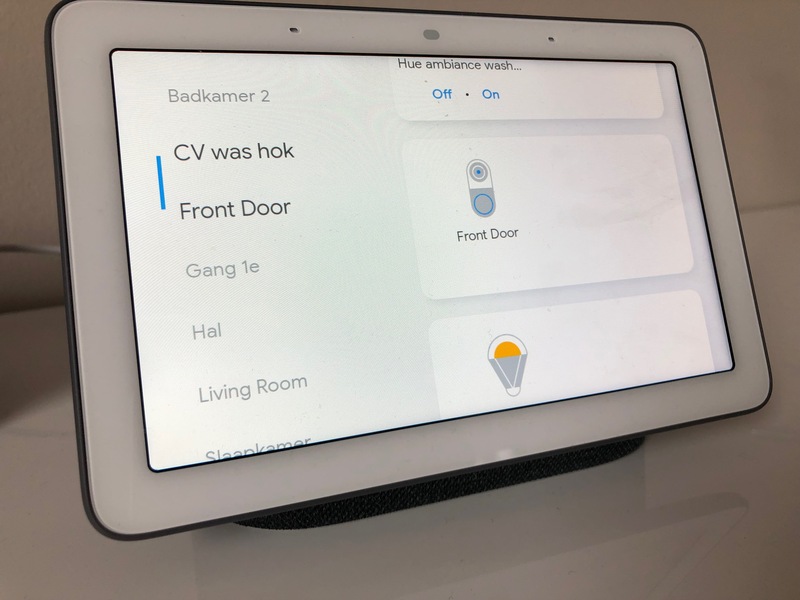 According to Google the Home Hub will play a central role in every household supporting a wide variety of possibilities and connections to other smart devices. The Google Hub smart display also fills the void that a purely vocal conversation leaves. Sometimes an image says more than a thousand words. For some use cases, merely voice just does not cut it. Let’s say you want to go for a weekend city trip, no idea when, no idea where to. Voice is great for an inspirational conversation in the search for the best fit. Images and movies on the Hub could assist in deciding where to go, and when the search is to an end and you are ready to book, a simple GUI, seat selection and a clear overview of the fight schedule is crucial. But not only airlines could benefit from the googles smart display, I also see a great potential for food retailers like Albert Heijn that could help out in the kitchen preparing Allerhande recipes step by step through voice and additional movies. And conveniently informing if items are running out of stock, offering to add them to the shopping list for next day. Like to discover more opportunities together? Please drop me a line. Note: A release date for the Netherlands is not yet announced at this point and therefor the Hub does not yet master the Dutch language. It has been about a year since my last blog post about the AI Garden, the chatbot that helps you take care of your plants. Now I would like to tell you about my latest additions to this project, visualizing garden data using a Google Home Hub smart speaker.